It seems like only yesterday that we reported that Google’s Nexus Q audio sphere went on sale. Oh wait, it was only yesterday. While initial impressions of preproduction Nexus Q devices handed out at Google I/O have been somewhat mixed, it appears that initial demand has been decidedly positive. Of course we don’t know how big the initial allotment of Nexus Q devices was, but whatever size it was Google apparently underestimated consumer response. 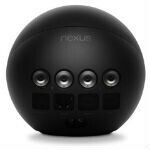 The Nexus Q ships as a mysterious looking sphere that allows Android users to stream audio and video. It includes an “audiophile grade” stereo amp with banana jacks that justifies the price for those of who love them some high-end speakers, but for everyone else the streaming options seem somewhat limited relative to competing products (the Q only streams media from YouTube and Google Play). Of course bigger things might be in store – Google hinted at I/O that significant updates may be coming. And the developer community has jumped on the device, porting CyanogenMod to it and allowing owners to launch games and other apps on the device. Whether that will translate into sustained demand probably depends on how quickly Google decides to expand the Nexus Q, and what aftermarket upgrades developers make available. Either way, the Nexus Q is off to a stronger start than apparently even Google expected. I would love it if only you could mirror your device on it through wireless. Who knows, maybe that will be one of the updates in the future. For now I think I'll hold off though. Really? I just don't see why anyone would want or need this. But hey, I still don't see why anyone would throw down $400 for a tablet when for maybe $100 more you could get a low end laptop that would be infinitely more flexible and powerful. So, I'm no tech Nostradamus. this is the one product i think google really messed up on… i am not sure why you would but this when you could have a roku for 200-240 dollars less, that accesses so much more than just google music, videos, youtube etc. The big thing for me is the audio streaming. I mentioned this on another article but I have speakers all over my condo and I hate that no matter where I am I have to walk to my receiver to change a song (currently using an AUX input 3.5mm headphone adapter for my Nexus). If I could just have the phone in my pocket and change a song, that alone is worth the money for me. The fact that I can also stream videos and stuff like that to my TV is an added bonus. I have been waiting for something like this for a long time, the only thing holding me back now is waiting for the dev community to do their magic so I can stream Pandora... and then that $300 is as good as gone! Wow never thought it would sell so well. agree with your super duper brainless commentary! buaaah! what the hell is this? still no googleTV with Jelly bean (the latest Android) full market, air stream, tv channels, NAS support? still stay with bugged Mediaportal ... how difficult is to make Big Nexus Phone just for TV? is it really so difficult?